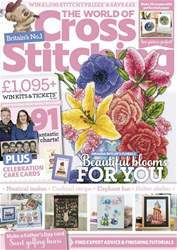 Our brand-new edition of The World of Cross Stitching is packed with 88 gorgeous patterns! 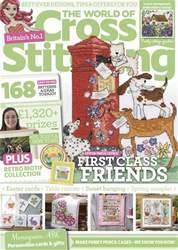 Stitch a set of folk art coasters by Poppy Benner, try April Rose’s vintage-style sewing pattern, try an intricate geisha on evenweave, and turn a fun washing line design into a peg bag. 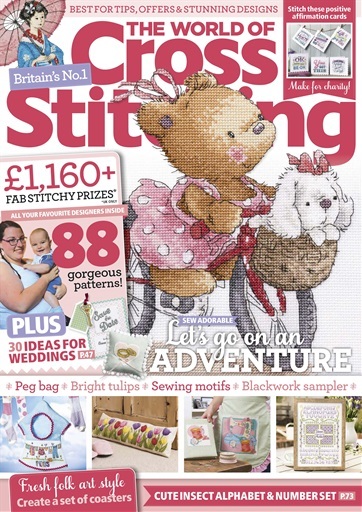 You’ll love the cover star – an adorable bear and her puppy pal on a cycling adventure by Ian Hallows! And we’ve got plenty of designs to brighten your home, including a tulips draught excluder and a floral blackwork sampler. You’ll also find prizes to win, the latest stitchy news and expert advice.